An anagram is a play on words created by rearranging the letters of the original word to make a new word or phrase. Anagram examples can be fun and witty, and they often end in hilarious results. One example is the word anagram itself. It can be turned into nag a ram! You can often find examples of anagrams in everyday life. They can be seen in crossword puzzles and games such as Scrabble. Kids and adults can both enjoy the fun in creating anagrams by rearranging letters of words and phrases to make something new and exciting. Anagrams have been popular throughout the ages. They can be traced back to Ancient Greek and Biblical times. For example, Plato and his followers thought that anagrams could unveil the words' hidden meanings. In the middle ages, scientists like Galileo coded their findings in anagrams until they were ready to reveal them. William Shakespeare's "Hamlet" is actually an anagram of "Amleth," a Danish prince. In Jonathan Swift's Gulliver's Travels, Gulliver visits Tribnia, also known as Langden, anagrams of Britain and England, respectively. J.K. Rowling uses the anagram "I am Lord Voldemort" as an anagram for the Dark Lord's prior name, Tom Marvolo Riddle. Anagrams are everywhere in Lemony Snicket's A Series of Unfortunate Events. Most often it's the author's name, such as Loney M. Setnick, and Count Olaf's name, such as Al Funcoot. In the movie and book The Shining by Stephen King, the character Danny screams REDRUM and writes the word on the mirror using lipstick. REDRUM = Murder. In the movie The Silence of the Lambs, the character Hannibal Lecter loved using anagrams as clues. One example of this was when he gave detectives the name Louis Friend. Louis Friend = iron sulfide. Iron sulfide is known as fool's gold. Whether it is for a game or just to have fun, you can use anagrams for a variety of reasons. They are easy to make out of any name or phrase. Writers often use them to add mystery or intrigue to a novel. 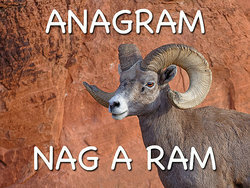 Anagrams are an interesting play on words and challenge us to be creative and witty. Have you thought of any creative anagrams? Share them in the comments below! "Anagram Examples." YourDictionary, n.d. Web. 23 April 2019. <https://examples.yourdictionary.com/anagram-examples.html>.